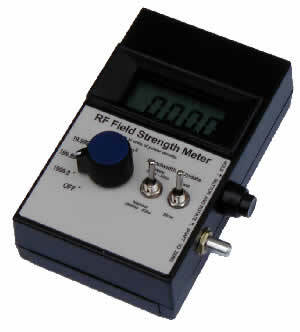 The Power Density Meter measures the RF field strength over the range 0.001 to 2000 µW/cm2. 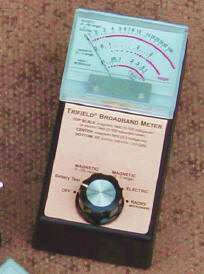 This extremely sensitive meter can accurately measure the RF background level even in rural areas. The meter reads true power density directly on the display with 3 ranges, 20, 200 and 2000 µW/cm2. For comparison, a typical cordless phone will produce about 0.01 µW/cm2 at a distance of 50 feet. At FM, TV and mobile phone frequencies, accuracy, is better than 3dB. Unlike many other power meters, it has built-in antenna and detection system which yields a flat response over a very wide range of frequencies. Even at 5GHz, signals can still be measured. The meter features an internal 9v battery with a low battery indication when there is about 10 minutes life remaining. Smart Fieldmeter™- Electromagnetic (EM) field monitor combining the major features of professional quality field monitoring equipment with convenience and simplicity of the multi-meter for users on a budget. Multimode (Average, Peak and Pulse) operation allows monitoring of the sinusoidal and modulated fields by displaying the average or peak values together with fast response remote output that can be used for remote data analysis and close loop field control. Portable lightweight design with long lasting battery and detachable isotropic probe offers advantages in the field, while tripod mounting of the probe and meter together with remote output monitoring benefits the EM field measurements in the laboratory setting. AM, FM, TV and Cellular stations. Industrial, Scientific and Medical Equipment. 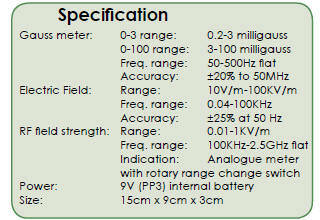 The PLIP is designed to comply with the CIPR16 requirements for a voltage probe. The design incorporates several features that are in addition to the basic CISPR16 specifications. Safety Complete galvanic isolation for protection against line voltages. Sensitivity The PLIP incorporates a 30dB RF amplifier. This results in a nominal antenna factor (insertion loss) of 0dB, against that of a 'conventional' voltage probe of 30dB. Protection The PLIP features signal filtering with transient limiter and output clamping. 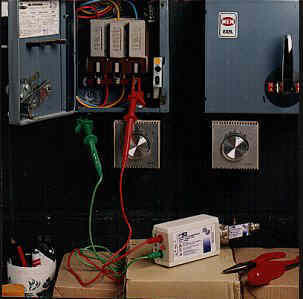 The net result is that any analyzer or receiver connected to the output of the PLIP is protected against damage due to high or transient signal conditions. magnetic fields from power line frequencies up to several GHz. microwave ovens, mobile phones and wireless LANs. 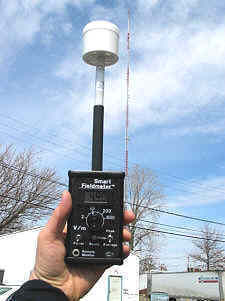 Radio / microwave alarm is the size of a small pager, just 5.7cm x 4cm x 2cm. The high sensitivity version is ideal for anyone who needs to find out exactly what is emitting radio or microwaves, including hidden sources. An industrial version is triggered by higher levels of radiation and is ideal for personnel alarm use when working near transmitters or RF sources. 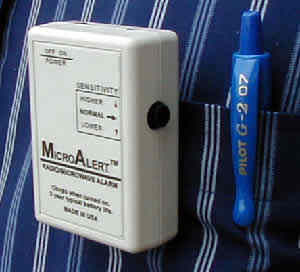 The alarm provides an audio output that bleeps when the pre-set level is reached, the frequency of the bleeps increases if the signal level increases. The sensitive version will detect a typical mobile phone base station from 100 meters, a mobile phone at 6 meters and a microwave oven at 3 -10 meters. The sensitivity can be adjusted to suit the application with a small adjustment knob.